This week’s Community news includes donations for the American Cancer Society and Canine Companions’ PTSD program. 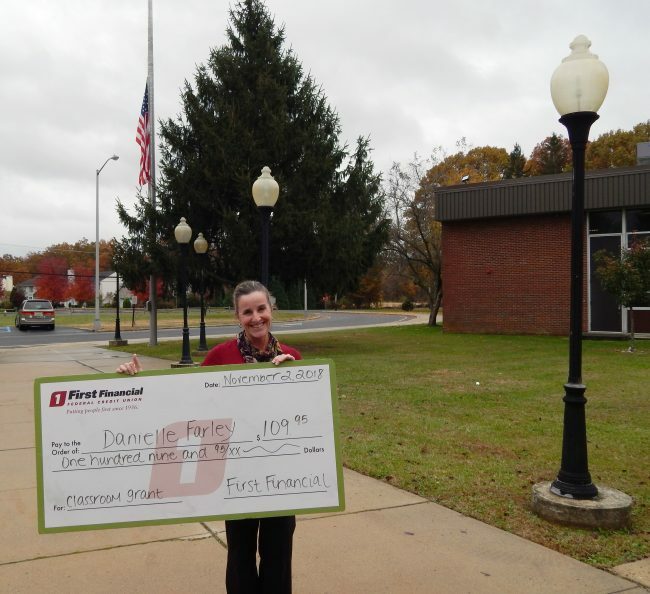 Grant Recipient Danielle Farley of Ramtown School in Howell, N.J., holds a check for $109.95. Farley, a Ramtown Elementary School third grade reading teacher, was surprised by members of the First Financial Foundation, the charitable arm of the $177 million First Financial Federal Credit Union in Freehold, N.J., with an Erma Dorrer classroom grant for the 2018 to 2019 school year. Ramtown School is part of the Howell Township K-8 School District. Farley submitted a grant application to purchase a one-year license for the Raz-Kids reading program for her students. The program provides hundreds of eBooks offered at 29 different levels of reading difficulty. Kids access their level through an interactive learning portal designed to keep them motivated and engaged. Every eBook allows students to listen to, read at their own pace and record themselves reading. Because First Financial began with a group of Asbury Park schoolteachers back in 1936, the credit union has remained committed to its educational roots. That is why its foundation offered current Monmouth and Ocean County educators six classroom grants to use at their schools for the 2018 to 2019 school year.